About- MM Enterprises Payroll Consultants  MM Enterprises is an ISO 9001:2008 Certified Company ensuring the quality of services. MME Payroll is a unit of MM Enterprises that is dedicated solely for providing payroll services to our existing clients and potential clients through MME Payroll division.  MME ISO Certified Payroll consultants in Delhi provides payroll outsource services in Pan India. We cater our services to various industry, small medium, and large business to manage their HR payroll process End to End solution. 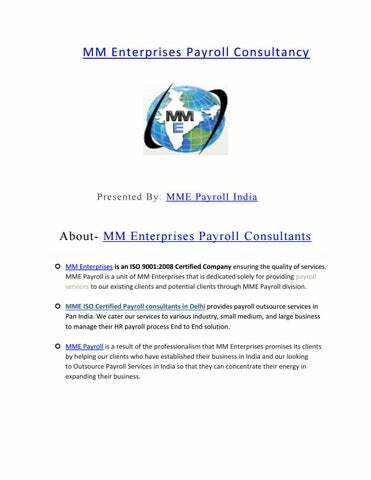  MME Payroll is a result of the professionalism that MM Enterprises promises its clients by helping our clients who have established their business in India and our looking to Outsource Payroll Services in India so that they can concentrate their energy in expanding their business. MME Payroll Consultants Nowadays payroll management consultancy in India is not really part of internal working of an organization rather it has become a different sector altogether.  Although organizations prefer outsource the job of payroll consultancy in order to make sure that all payroll related jobs are carried out efficiently and effectively. The Payroll Management Consultant services can be generally categorized into 4 categories Human Resource Services.  Payroll and Tax Administration.  Employee Benefits.  Insurance Services. 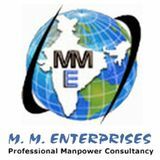 MME Serves all over the world If you are hunting for Payroll Consultancy in Delhi, India or globally with a promise of commitment, believe us you don’t need to look any further. You can bank on us even if your business setup is small-scale, start-up, medium-sized or large-scale. Start-Ups & Small-Scale Businesses  If you are running a small-scale business or a start-up or are thinking to start one, you’d need to pay special heed towards building your customer base & expanding your business. Large-scale Businesses  With a large business comes a huge amount of employee data and administrative responsibilities. MME Payroll Consultants in India will benefit your large-scale organization with efficient and cost saving solutions.  So, join hands with the global leader in payroll management & get ensured monthly processing of Provident Fund (PF), Employee Insurance, Tax Regulations, Labor Welfare Fund (LWF) and other compliances. MME Staffing Services MM Enterprises is the leading Staffing Services in Delhi in domains such as Engineering, IT, Education, Infrastructure & the list goes beyond. With years of experience, we have been sourcing the right resources from the competitive market and helping you retain the highly-skilled talent of your organization.  We have the required technology, skills and expertise to benefit you with our best in class services. This is the reason our past and existing clients have entitled us as the best staffing companies in Delhi.  We build the platform and deploy exceptional techniques to meet your organization's HR needs. Once you meet our team, you will understand that MM Enterprises Recruitment Consultants comprise of experienced professionals who are capable of identifying your needs & providing rock-solid solutions. MME Payroll & Staffing Services  With our focused vision, in-depth industry knowledge, and experienced human resource, we at MM Enterprises have emerged as a reputed name in Staffing services in Delhi in the national and global market.  We have offered innovative ideas to meet the diversified needs of our clients. Over the years, we have strongly positioned ourselves among the specialist staffing companies in India.  Ever since MM Enterprises was born, our philosophy has been to locate Quality Resources out of the pool of eligible candidates. Our expert team has addressed the staffing needs of diverse clients, working in IT, Banking and Finance, Telecom, Consumer Goods and various other sectors. With a repertoire of flexible placement services such as contract staffing, permanent recruitment agency in India, outsourcing services & more.